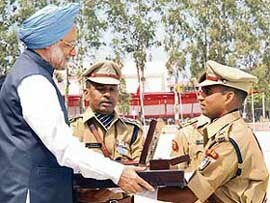 Describing terrorism as the most dangerous threat and a hydra-headed monster, Prime Minister Manmohan Singh has asked police personnel to gear up to meet challenges to internal security. Will the back channel talks between India and Pakistan lead to lasting peace? In what may turn out to be one of the biggest ever land scams in this region, about 2,870 acres of land located just on the boundary of Chandigarh has been usurped by influential people reportedly in connivance with some revenue officials of Punjab. The government said today there was 15 days of reserve stock of liquefied petroleum gas for use in the country and the Oil Marketing Companies had already floated tenders to procure fuel from abroad in an eventuality of a shortage following the fire that broke out in the Reliance Refinery at Jamnagar, Gujarat. A severe hailstorm which hit Sarsawa airbase three days ago has caused heavy damage to several IAF helicopters. Union HRD Minister Arjun Singh’s assertion that deemed universities have unanimously agreed to implement the OBC reservation was refuted by heads of many such institutions who claimed that they were “not even included in the meeting called to discuss the issue”. Gearing itself for the coming Assembly elections, the BJP today announced that it would hold a series of anti-terror rallies in different parts of the country, including Ayodhya, next month. In an unprecedented move, the Punjabi University authorities allowed a function organised by it to propose 'tankha' for SGPC chief Jathedar Avtar Singh and subsequently 'tankha' was also announced on the spot. The police today began investigation into the killing of DIG Jaswinder Singh allegedly by one of his two PSOs, facing charges of murder, who have been remanded in police custody. The police force should have a humane attitude towards all those who come into contact with them.